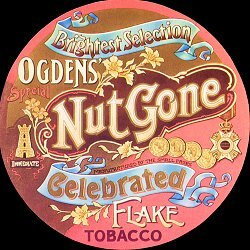 The Small Faces were a highly influential English rock band active from 1965 to 1969. The Small Faces' move to Immediate Records had started the most artistically creative era of their career, first with the #12 hit "Here Come The Nice" and a brilliant self-titled album. They then released three of their best singles, the first of which was the psychedelic pop tune "Itchycoo Park", which was a #3 UK hit in 1967. It also gave them their first (and indeed only) US hit, getting to #16 on the other side of the Atlantic. This was followed by "Little Tin Soldier", a soulful rocker which got to #9 and is surely one of their finest songs. The third hit was "Lazy Sunday", a rowdy knees-up which saw Steve Marriot singing in an exaggerated cockney accent. Originally recorded as a joke, it actually got to #2 and became one of their biggest hits. 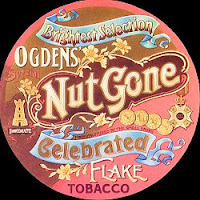 Their next album saw them fully commit themselves to the new psychedelic pop sound with 1968's Ogdens' Nut Gone Flake. "Lazy Sunday" was featured, as was another similar cockney-rock song ("Rene"). The entirity of side two was taken up by a bizarre, whimsical fairy tale told through song, with narration between each track from comedian Stanley Unwin spoken in his own self-crafted 'Unwinese' gobbledegook. The album turned out to be a critical success, the band's very own Sergeant Peppers', and it made it to #1 on the UK album chart. Due to the complexity of the material they only ever performed it live once, on the BBC. I love love love your work, but for the past week or so, Zshare has been unusable. (I've not had problems in the past.) Zshare is really slow to load, I guess due to all the ads and popups, and the countdown timer never gets past 23 or 22 seconds. And while it's doing that, it virtually freezes all my other browsing activities. I'm not complaining -- beggars can't be choosers -- I'm just letting you know. Just want to say thanks for more or less extending the shelf-life of this special album. I hope old ears hear it anew and new ears perk up to its unique qualities. It comes out of a peculiar time in history, and a very specific cultural place, so hearing it is a bit like opening a forgotten paisley-covered book and having an exotic dried flower fall out of it. You wonder what the story was behind it. All there is an inscription saying, "Love. Steve Marriott" Here's a clue though; Steve Marriott was a stone soul genius. Some American GI during WWII must have left a bit of Ray Charles' cultural DNA behind on his boot-heel. I'm with Weller on this one. Yeah, I know. It's called an anachronism. Anything is possible in the blogosphere. In space no one can hear you scream. This group and this music is awesome....very The Who like. thanks for all of this great music.